Crafting an enamel dial demands the same high level of precision, skill and patience as that of engineering a mechanical watch movement. Enamel is soft glass composed mainly of silica. When heated at extremely high temperatures, it liquefies and fuses with metal. It can take on different colours when mixed with other elements such as red with iodine and green with chromium, a useful trait when it comes to creating delicate works of art. In experienced hands, like Ulysse Nardin’s very own enamel specialist Donze Cadrans, an enamel dial maintains its radiance forever, the vibrant hues promising not to fade with the passing of time. 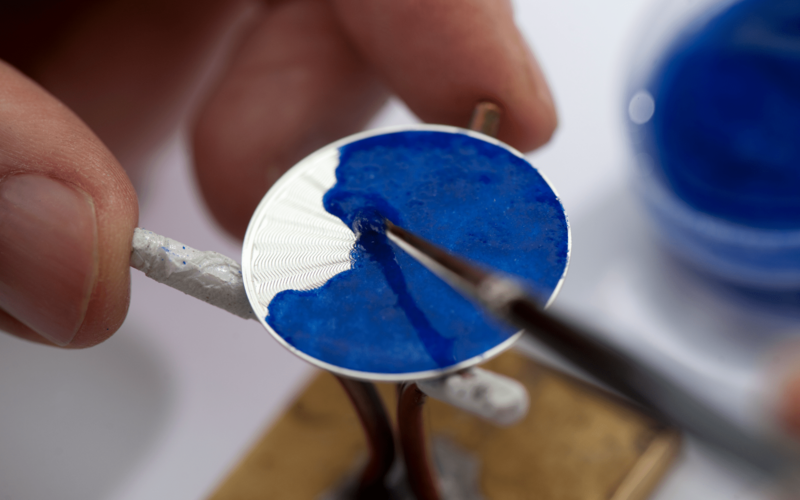 Here are the stories behind three main types of enamelling technique – grand feu, champlevé and cloissone. Perhaps the most commonly used technique, grand feu is no less tricky to execute. Meaning “great fire” in French, grand feu involves coating a metal disc with enamel a few times. Between each coating, the enamel is fired up the enamel at temperatures of 800°C - 900°C. This process is repeated a few times to achieve the desired motifs, colours, and depth. Another difficulty of the process is that due to its susceptibility to external environment such as humidity and weather, not all enamel will come out perfect. In fact, most will suffer from blemishes and bubbles, and have to be discarded. A fine example of this technique is Ulysse Nardin Marine Tourbillon Blue Grand Feu. The dial boasts a combination of two traditional watch decorative techniques – guilloche finished with deep oceanic blue grand feu enamel, one of the toughest colours – not to mention one of the prettiest – to achieve for enamel. Fine strips of gold wire are bent to create the outline of the desired motif on the dial. The individual cells (or “cloison” in French) are then applied with a few layers of enamel, each layer fired in a kiln at temperatures between 800°C and 1200°C. The end result is akin to a painter’s work, a visual feast of details despite the constraint of space. Showcasing this artistry brilliantly is the new Patek Philippe Ref. 5531R World Time Minute Repeater that features a central dial that depicts the Unesco World Heritage Site of Lavaux wine region using this particular technique. The entire process took three weeks to complete, and is the first Patek Philippe minute repeater ever to be decorated with cloissonè enamel. The technique is similar to cloissonè except that instead of using wire strips, cells are carved out on a metal plate with a chisel. The enamel is made even more glorious with the incorporation of precious powder – think gold, diamond, platinum and pearl – in Vacheron Constantin’s new Métiers d’Art Villes Lumières collection depicting bird’s eye views of the cities of Geneva, Paris and New York in nocturnal light. Meticulously executed by Japanese artist Yoko Imai, each powder is chosen according to size and shimmer, and placed at different angles to ensure enhanced radiance and realism. ICYMI: More artistically inclined watches here.